With its signature green and chrome die-cast casing, the 520DX "Green Bullet" holds a spot in history as the definitive blues harp voice. 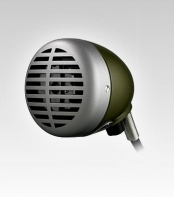 The 520DX features a volume control knob at the base of the microphone that allows users to make adjustments to suit their needs during live performance. An attached cable with a standard 1/4-inch plug allows the microphone to be connected to a high-impedance device. Contoured to fit perfectly between harmonica and hands, it can also be used for distinct, lo-fi vocals.